Talk Trash the Traditional way. The Internet has done great things for the country. We can send messages anywhere in the world quickly and for free. Pictures of cats doing funny things can now be shared with dizzying speed, and best of all, trash talk among martial arts can reach epic levels. To illustrate, I have assembled a pie chart for your examination. This is based on information I made up on the spot which I have acquired from years of making things up. However, since this was plugged into a pie chart, I insist is stands as undeniable proof misuse of Internet resources by the martial arts. Naturally, this blog belongs in that 4% you see there in red. Why do I say that martial arts are misusing their bandwidth? It comes down to a joke I heard the other day. Dude 1: How many martial artists does it take to screw in a light bulb? Dude 2: I don’t know, how many? Dude 1: One hundred. One to screw in the light bulb and ninety nine to watch and complain about how under qualified he is. Dude 2: I don’t get it. But I did. 86% of the Internet martial arts resources are devoted to talking about how much the martial artists love their own martial art and how bad they think all other martial arts are, and how stupid their followers are. Now I see nothing wrong with this. It is a time honored tradition of martial arts to talk trash about each other, but it used to be confined to the dojo and it used to be couched in flowery respectful language. Instructor: I visited (fill in the blank martial arts school) today. Instructor: Their teacher was very respectful. Student: Thats good. How was the class. Instructor: You know that I have always said to be respectful of other styles, so I don’t want to be disrespectful to theirs, but I could have totally killed everyone there with my eight fingered wing chop of death. I played alot of video games growing up. I loved playing Double Dragon, so when I saw this I just had to share it. And since my wife would just call me a nerd, I’m sharing it with you instead. Sometimes even winning is losing. Self defense from dummies? 5 attacks that need no defense. Who says you need to be in shape to fight? If Brock Lesnar can cross over from fake fighting Pro Wrestling to real fighting MMA, it comes to no surprise that Tim Sylvia can cross over into Pro Wrestling from MMA. 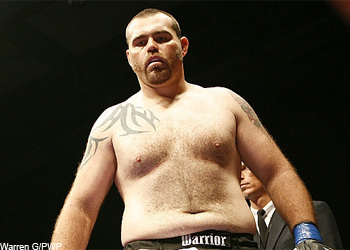 Tim Sylvia is a former UFC Champion who is best known for pushing his opponent against the cage and leaning on them. This is exactly as boring as it sounds. Well he was supposed to fight in the upcoming Dream MMA card, but his opponent was late getting out of jail and couldn’t get his visa in order, so the fight was scrapped. So instead he will be faking a fight on the same card. Hopefully it will be more entertaining then his real MMA fights. Sorry for all the videos lately, but with the Holidays, every spare moment has been filled. I am sure that the three fans I have forgive me, so I have this tid bit for them. Alot of Stick fighting school fall into the reality martial art side of the martial art continuum. I mean, if we want to be realistic, who wants to fight someone bare handed in the first place. Well in the video below, two crazy stick fighters beat the tar out of each other in the woods, in one of the more realistic sparring matches I think I have seen. Ouch. I am not sure it was worth it. Kind of funny how it turned into a grappling match at the end. And they say BJJ is unrealistic. Don’t worry, I won’t tell anyone. Best self defense video ever. Its a little long, but totally worth the watch as every moment of this video is worth watching. I really loved how he promoted his student and gave him a double white belt. Thanks to Fitz for the tip. Um…wow. Its a rap about jiu jitsu by MMA fighter Ralek Gracie. He is the son of Rorion Gracie, he has a short but undefeated MMA career, and he teaches out of the Gracie acadamy, the orginization that brought you the online blue belt, and the pnk belt. They now bring you “G in a Gi”. This will finally bring BJJ the street credit it had been lacking before. round. Fights where I get hurt and bleed a little but I kinda rally back. Yes Forrest, I’d like to see it. What I would like to see more is to see you take some time, train up and get back out there. Goodness he’s only 32 years old! Randy Couture is 48. 32 is not a good retiring age. So he’s been having a hard time lately. Stop fighting people like Anderson Silva and Shogun Rua for a little while. A lot of people lose to those two, it doesn’t mean its the end of the road! Dragon Ball Z is close to the hearts of alot of adult martial artists. The Japanese anime series was started in 1989 and finished in 1995. So depending on your age, it might have been your first taste of martial arts, or it might have simply served to help inspire you to do your pushups. It was also known to cause seasures in certain people. It also annoyed parents. So it isn’t surprising that this generation of fighters in the UFC can trace their martial ambitions to DBZ. In a recent interview, Marcus Brimage (one of the winners of the Ulimate Fighter TV show) claims that it was the reason he started training. Marcus, I still want to fight like that too. I’m still working on flying and shooting energy from my hands, but I get what you are saying. Sadly I do understand what he is saying. Wow, and my mother said watching all that TV was going to be bad for me. everywhere. That’s the (expletive) that gets people standing up on their feet. So that’s how Dragon Ball Z is, and that’s why I always push my cardio. Well if watching Dragon Ball Z will do anything for you, pushing your cardio is one of them. I still can’t watch the show without doing pushups at somepoint. Ninja from Olivier Trudeau on Vimeo. Just had to post this. What a great job. Did you catch the Shadow kick from Iron Monkey in there? +5 for awesomeness.